There is a universal need for unique and simple software in business. The speed of technological evolution has forced companies to rethink their business processes and redesign the same. Intelligent technologies are leading this revolution and affecting every facet of the businesses. It’s a challenge for every business to adopt the right technology trying to revamp their business operations at low cost. 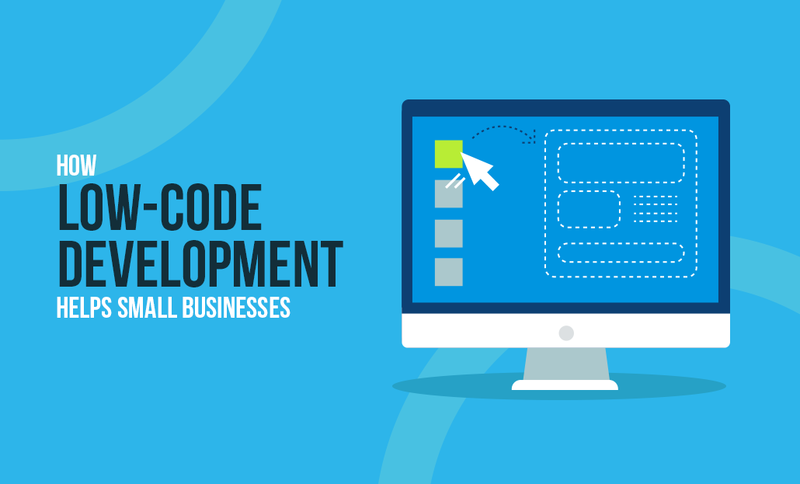 This blog discusses how low-code development helps small enterprises. The demand for software application development is growing at an exponential rate. According to Gartner, the market demand for software application development will increase at least five times in 2021. Moreover, traditional software development is a time consuming and costly process with enormous backlogs and for small businesses, it is exceptionally challenging. Gartner believes that by 2020, at least 50 percent of all new business applications will be created with high productivity toolsets and low-code platform is one of them. The next technology for changing the development landscape could be low-code development platforms. Low-code development enables users to design and create applications with little or no code. It encourages IT and business professionals to use graphical user interfaces for creating business application software instead of traditional computer programming. The Low-code platform has visual interfaces with the flexibility of drag and drop for simplifying application construction. All components of the project such as frontend & backend code and configuration files are generated automatically using the best practices. A Low-code development platform utilizes fourth-generation programming languages as well as agile application development tools to restore large hand coded data, which enables you to restructure, simplify, and speed up the product delivery by decreasing huge backlogs. Manual coding introduces many errors which can be eliminated with low-code. By using the cloud, you can start with small increments and then roll out a variety of scenarios. It ensures you to test scenarios within a scalable and integrated environment. The development tools for low-code apps are designed for the internal teams. Companies don’t need to increase the cost by hiring an external app development team. In addition, the updates can be performed by the internal team. Low-code development frameworks help the companies to bridge the skills-gap by allowing the existing IT staff and non-developers to quickly and easily build mobile apps. Developing a custom application or a mobile app is a long and recursive process and sometimes it ends up by taking more than a year. However, the low-code framework decreases the development cycle dramatically. The low-code app can be developed in parallel with business requirements by internal staff. You can select options like 'no code' and 'low-code' for development (point and click application development). The low-code frameworks also have options to incorporate the pre-existing software or develop new customization. The tools are designed with targeted ease of use, facilitating the internal preexisting teams to work on it, thus saving time and money on additional training. The low-code framework offers cross-platform deployment across mobile, web, desktop, and cloud. It is fully integrated with backend systems and it also facilitates dynamic synchronization of data between user devices and backend databases. Low-code platforms allow companies to start small with perhaps just a web app, progressing to hybrid or even fully native apps as per the business needs. Despite having some sheer advantages, like everything low-code framework also comes with limitations. John Rymer (VP Forrester) said that these platforms are productive as they provide a framework for the development of business owners. Sometimes, low-code framework creates challenges to work in a unique production line. While low-code tools can be a powerful asset during the POC and some UI / UX problems can be simplified to run an app faster. There is still a significant need for developing skills to customize the project, create backend APIs and manage infrastructure deployment. Here are a few real-life examples of how low-code has helped organizations. Low-code platforms can help organizations to overcome the lack of coding skills and improve collaboration within the development team. It also helps the end users to achieve better business outcomes more quickly. Low-code platforms increase the effectiveness of cloud-ready applications that are large, secure, and fully integrated. Many organizations that are experienced in low-code development are expanding their development teams to meet the growing demand. They execute mission-critical company applications. However, low-code platforms are a golden opportunity for small businesses. As the citizen developer continues to become a contributor in this space, small enterprises can be early candidates for this technology.